This recipe was an experiment that turned into a serious keeper. The great folks at Oh! Nuts were kind enough to send me some of their quality wares and I developed this recipe in an effort to feature their sweetened dried cranberries. I take product endorsements very seriously, and this company has some of the nicest dried fruit and nuts that I've come across. I am still nursing my way through the bag of salted cashews and dried mangos. I feel a couple more recipes coming on. I've found that pork and cornbread are a magical combination -- especially when stuffed, then roasted or grilled. 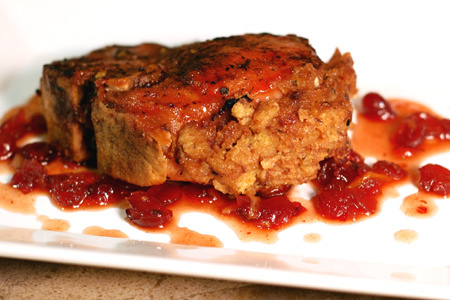 This recipe adds that familiar tang of cranberry both in the stuffing and in the finishing glaze. It's a serious fall flavor explosion. Mix the wine, 3/4 cup of the water, cranberries, and half of the ground pepper in a small sauce pan. Bring the mixture just to a boil, remove from the heat, cover and set aside. Grind the salt, sage, thyme, tarragon, and the peppercorns in a mortar and pestle or an electric coffee grinder dedicated to spices. Prepare the stuffing according to the package directions and set aside to cool. Puree the cranberry mixture in a food processor or blender until it has small chunks of cranberry left in it. Add one cup of the cranberry puree to the stuffing and mix well. Combine 1/2 cup of the cranberry puree, the marmalade, 1/2 cup of water, honey and the remaining ground pepper in a small sauce pan. Bring the cranberry mixture to a gentle boil and reduce by 1/4 to create a glaze. Remove the glaze from the heat and set aside to cool. Gently cut a horizontal pocket in the center of each chop (all the way to the bone). You do not want to slice the chop -- just create a pocket. Season each chop moderately inside and out with the ground herb and seasoning mixture, and let marinate 20-30 minutes. Prepare your grill for two-zone cooking (direct and indirect) at medium-high heat (about 350º). Gently stuff the pocket of each chop with the stuffing mixture. Compress the stuffing until the pocket is almost full (about 1/2 cup each). 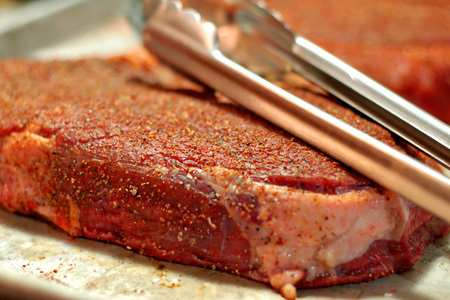 Quickly grill each side of the chops over direct heat until they are seared and have grill marks. 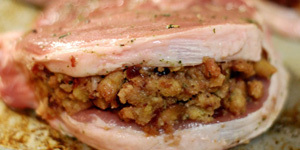 Move the chops to the indirect part of the grill and cook until the center of the stuffing reaches 140º. Remove the chops from the grill, drizzle with the glaze and let them rest for five minutes. Drizzle each chop again with the glaze, serve with the remaining cranberry puree on the side and enjoy. This post could get me in some trouble. You see, this is a serious traditional side in our family and I don't know how they'll feel about me putting it out "in the wild", as it were. It might be surprising to some that, although I've been making these since I left home 24 years ago, I've never had a recipe. It's one of those things that I've always made by look and feel. Well, you can't share something you can't document and repeat, so tonight I actually cooked these scientifically and documented it. 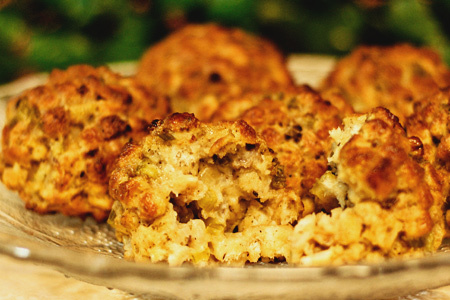 The idea of stuffing balls might seem odd, but it really makes a lot of sense. First, let me say that I am not a fan of stuffing my turkey. It slows down the cooking and the meat is overcooked by the time the stuffing is at a safe temperature, but I digress. However, I am a great fan of stuffing, which leaves me with the prospect of making dressing (stuffing that isn't stuffed). This leads us to the perfect combination of crunchy and soft and moist stuffing (dressing) that is stuffing balls. Enough of the explanation, let's get on the business end of some cooking. Heat the olive oil in a medium saute pan over medium-high heat. Add the celery and saute five minutes. Add the onion and saute five minutes more. Put the soup, broth, garlic salt, poultry seasoning and pepper in a large mixing bowl. Add the sauteed celery and onion to the bowl and mix well. Add the stuffing cubes to the bowl and mix very well. Let the stuffing sit in the bowl 20 minutes, stirring occasionally. Using your hands, gently form the stuffing into 2 1/2" balls (about eight) and place them on a large non-stick or lightly greased sheet pan. Make sure there is at least an inch between each ball. Note: Compress the balls just enough to hold their shape. Bake on the middle rack one hour or until the balls are nicely browned. Remove the pan from the oven and lightly brush each ball with the melted butter. FireCooker.com is a great new live-fire cooking community site where I contribute recipes. Of course, there are plenty of other cooking sites out there, but there are a few things that make FireCooker unique. First, the site is dedicated to real backyard barbecue and grilling. Second, their pitmaster is none other than Dr. BBQ, Ray Lampe. That fact alone should be a big clue as to how serious the site is. Also, the fresh site design is a very welcome improvement over the look and feel of other barbecue sites. It really does look nice. I realize that this might not be a major consideration for many, but as a web developer I really appreciate the professionalism of the site. You can think of FireCooker as a sort of "Facebook of backyard cooking". They showcase a lot of recipes and how-to information for anyone interested in outdoor fire cooking. This is also one of the first grilling or barbecue sites that I've seen feature user-contributed videos. This really helps bring the content alive. The site also features professionally produced videos with Dr. BBQ. Here is an example of the videos you will find at the site. So, if you're interested in sharing your barbecue exploits, or just want to learn how to get better at it, I encourage you to head over to FireCooker.com and get involved. It's a great site that I think you'll really enjoy. As some of you may know, the TLC network will begin airing the first episode of their new eight-week docu-series, BBQ Pitmasters, December 3rd (10 PM / 9 PM central). According to the press release, the series will be "...taking viewers into the high-stakes world of competitive barbecue. Following some of the biggest names on the circuit, each episode travels to a different competition and show viewers what it takes to win big in BBQ." "The men and women featured are part chef, part athlete, and part five-star general. They not only talk a big game, but walk it every step of the way: with grease on their hands, sweat on their brows, and meat on their minds from sun-up to sundown." The new series has certainly piqued the interest of many competitive BBQ cooks, this one included. I was very fortunate to be given the opportunity to ask the Executive Producer, John Markus, a few questions about the new series. In addition to this series, he also produced "The All-Star BBQ Showdown" and "Barbecue Championship Series" in 2005 and 2006, respectively. Here are the questions that I posed to Mr. Markus. Me: What was the inspiration to create the BBQ Pitmasters series, and what is the intended audience? JM: Back in 2000, I was fortunate enough to meet legendary Paul Kirk, The Baron of Barbecue out of Kansas City, who agreed to let me cook on his team. At the time, all I knew was that I wanted to study the methods of making delicious brisket and pulled pork. I had no idea that competition bbq, a rich and varied subculture, existed. On the circuit competing, I met some of the legendary pitmasters, who not only shared cooking secrets, but also told me their personal histories, as each described their path to barbecue. One of them, three time world champion Myron Mixon, a true bbq legacy, had such a fascinating personal story that I just completed a documentary film about his family. Myron competes thirty six weekends a year, and that led to the idea of shooting a series about full time competition 'Q'r's-- a show that would accurately convey the rigors of the road and the challenges of this demanding lifestyle. TLC recognized the potential of the series and ordered BBQ Pitmasters. We hope the show appeals to men AND women interested in learning this truly American culinary art and intrigued by the life of competition barbecue. Me: How is the BBQ Pitmasters series different from the other competitive barbecue series that have aired on other networks? JM: BBQ Pitmasters shows in detail all the demands of cooking in competitions: the extreme weather, the allnighters, the hardships and unpredictabilities of the road. This show is also meant for the serious student of this food. After watching a few episodes, a viewer will actually know how to cook award winning 'Q. In addition, viewers will get to know these characters up close and personal. Their strengths, weaknesses, and most importantly, their humor. It is the first genuinely in depth look at this world. Me: How did you select the competition teams that appear in the series? JM: The pitmasters selected to appear on the series are true champions in the field. They have won dozens of Grand Championships and collectively earned hundreds of thousands of dollars in prize money. They are also comfortable with our cameras trailing them day and night for weeks at a time. We have all become one large family. Me: Were all of the teams filmed at actual competitions, or are there also staged appearances? JM: Of the eight episodes produced so far, seven were filmed at actual contests, where our pitmasters competed alongside each other and scores of teams from all across the country. Shooting at actual contests lends each episode a genuine reality, with our cast members challenged by real rules and deadlines. We want viewers to feel what these contests are actually like, the highs and lows of this demanding pursuit. We also created one contest in West Texas: The Johnny Trigg Shootout. There, it was just our seven cooks chasing several thousand in cash, but then we threw them a real curve. We selected a few tough master judges and filmed their judging session. Then, we encouraged these judges to speak freely about the entries after they scored them. Finally, we screened the tape of that session to our cast and filmed them watching. You can only imagine how raucous that viewing got! Me: Do you envision the series continuing in the future, or is this a one-time project? JM: I can imagine BBQ Pitmasters continuing for at least a hundred episodes. We have just scratched the surface of this complex world, and there are so many fascinating, funny folk involved in the sport. And it's not just the competition aspect. The skills and methods involved in turning out the perfect bite of smoked brisket or ribs makes for great television. I don't ever see us running out of fresh material. I thank Mr. Markus and Dustin Smith, Director of Publicity at TLC, for their assistance with this post. It's great to have such an opportunity. I am really looking forward to this new series. Yes, you read that right, it's a barbecued sweet potato pie. It's not barbecued because I cooked the whole pie in the smoker -- just the sweet potatoes for the filling. I mentioned in an earlier post that I conducted an experiment, and this is it. 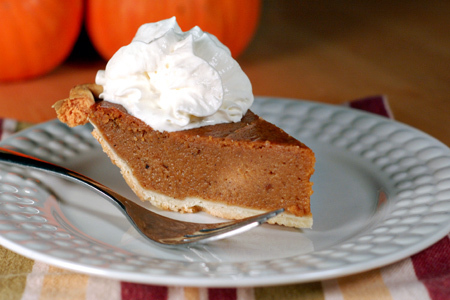 In reality, the idea for this pie is what sparked the earlier recipe. Despite sounding odd, the results were very good. The pie is very rich and has a subtle smokey flavor. It's so subtle that I think some might not even notice. It's just a standard sweet potato pie recipe, aside from the barbecued potatoes. 3 cups Barbecued sweet potatoes, mashed. Put the potatoes and the milk in a food processor and process until it is very smooth. Add the butter, condensed milk, sugar, eggs and vanilla to the food processor and pulse a few times to combine. Note: You need the mixture to be the consistency of a milkshake. If it's too thick, add more milk as needed. Pour half of the filling into each pie shell. Bake the pies on the middle rack for one hour, or until each is set in the center. Cool and serve at room temperature, with whipped cream, of course. Tonight I was a guest on Greg Rempe's BBQ Central Radio program. I talked about my Classic BBQ Chicken Drumsticks and Fairly Simple Beef Stew recipes. If you've never heard the program, I highly recommend that you peruse the podcast archives and hear what you've been missing. Greg offers the only weekly show of its kind. It is truly the best-produced live-fire cooking show available. Tune in each Tuesday and hear the show live at 9PM ET on LA Talk Radio Channel 1. Here is a great simple side dish to accompany barbecue or just about any rustic meal. The smokey flavor helps to cut the natural sweetness a little while adding a unique dimension to the flavor. Although the ingredient is listed as "yams", they are actually sweet potatoes. I am simply using the grocery store name to avoid any confusion. Why they insist on calling them yams is beyond me, since the two aren't even distant botanical cousins. I served this with grilled top sirloin and made extra for a little experiment that I'll be blogging about soon. Mix the sugar, pumpkin pie spice and half the black pepper in a small bowl. Add the oil, salt and the remaining black pepper to a gallon size zip-top bag, seal, and slosh to combine. Add the yams to the bag, remove the excess air, seal and leave at room temperature for an hour or two. Start your fire and prepare for indirect cooking at 275º. Add one small chunk of fruit wood (apple or cherry) to the fire about 10 minutes before you're ready to cook. Wood chips soaked for 30-60 minutes will work well, too. If you're using a gas grill, make a small smoker pouch. Drain as much of the oil from the bag as you can, add the sugar mixture, re-seal and shake the bag to coat the yams as evenly as possible. 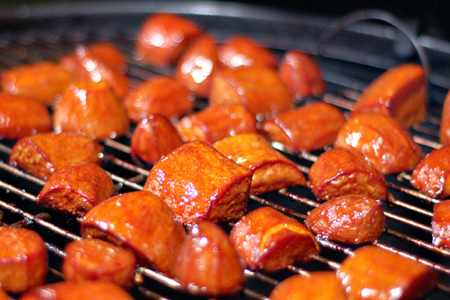 Arrange the yams in a single layer on your cooking grate and cook indirect for 20 minutes. While the yams are cooking, mix the glaze in a small bowl. 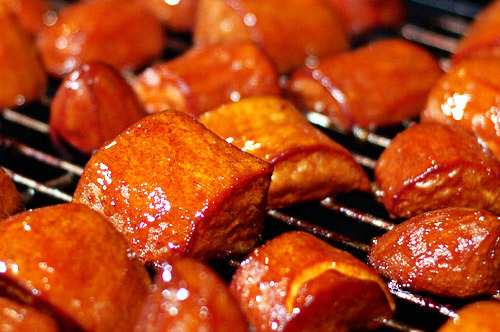 Glaze the top of each piece of yam, turn each over and cook another 20 minutes. Glaze and turn each piece again, and cook another 10 minutes. Remove the yams to a serving bowl, drizzle lightly with the glaze and toss very gently.